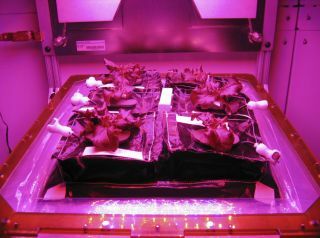 Astronauts longing for fresh lettuce in orbit will soon have the chance to grow it for themselves: NASA is sending a mini-farm into space. When the private spaceflight company SpaceX launches its next Dragon cargo mission to the International Space Station on Monday (April 14), the capsule will be carrying a small plant growth chamber built to let astronauts grow "Outredgeous" lettuce in orbit. A 28-day-old Outredgeous red romaine lettuce leaf growing in a prototype spaceflight pillow. "Veggie will provide a new resource for U.S. astronauts and researchers as we begin to develop the capabilities of growing fresh produce and other large plants on the space station," said Gioia Massa, NASA payload scientist for Veggie, in a statement. "Determining food safety is one of our primary goals for this validation test." Space is at a premium on a spacecraft and also on the International Space Station, so the Veggie chamber is built to collapse for transportation and when it is in storage. When fully deployed, it's about a 1.5-feet (X meters) long, making it the biggest such plant chamber in space to date. A version of the chamber has been tested on the ground, where lettuce and radishes were successfully grown at the Kennedy Space Center's space life sciences laboratory. Veggie was developed by Madison, Wis.-based Orbital Technologies Corp.
NASA's Veggie experimental space farm is slated to launch on SpaceX's Dragon capsule at 4:58 p.m. EDT (2058 GMT). Visit Space.com for complete coverage of the Dragon mission to the International Space Station.